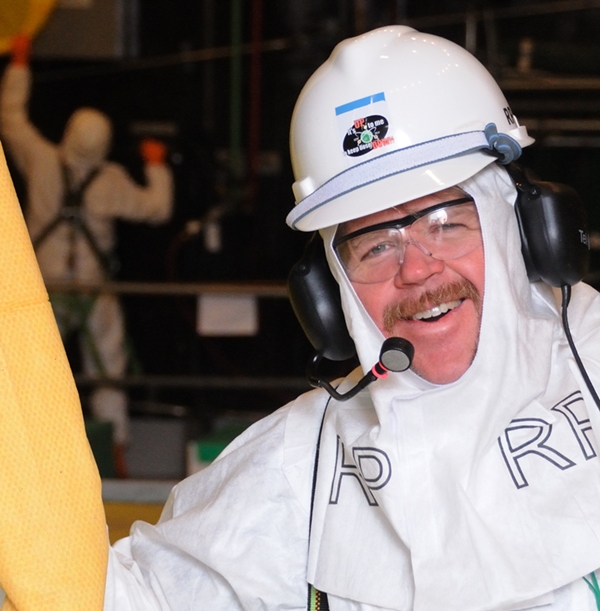 Our PolyZolv™ and OREX™ clothing supplies the nuclear power industry with comfortable, single-use protective clothing. Join the growing number of plants that enjoy the benefits of reducing waste, cost, security hassles and personal contamination events through the use of our products. Disposal is fast, safe and convenient. We transport your used clothing to our processing facility, where the final resulting effluent is carbon dioxide and water. Simple, effective, and eco-friendly. This white splash resistant coverall has a dosimetry loop, chest pocket, reinforced knees and a tight weave in its structure, yet is breathable and comfortable for the wearer. There are thumbholes on the inner sleeve and a large cargo pocket on the right upper pants leg, and this pocket is secured with a hook and loop flap. Our products are lightweight yet designed and constructed to provide the highest quality, safety, comfort and performance on the job. We consistently look to our customers to provide feedback that inspires designs for new products and helps to improve our existing offerings.